When Greek and other European leaders came to the 17th hour of their all-night talks that culminated in an agreement Monday morning, their immediate concerns were economic. But experts say there were also serious strategic issues driving them toward the accord. The leaders avoided the unprecedented removal of a country from the common euro currency, and possibly from the European Union — a result experts say would have had broader implications. “That would mean that the European Union is not only not an optimal currency union, something that economists have already stressed, but it’s also a very profoundly dysfunctional political project,” Aris Trantidis of the Department of Political Economy at London’s King’s College says. The accord will cause more hardship in Greece, but experts say an exit from the eurozone would have been worse - not only for the Greek people and Europe, but also in geopolitical terms, if Greece fell into economic depression and social unrest. “What will happen within Greece, and also its geopolitical orientation, if there is a catastrophic event of dramatic proportions that ‘Grexit’ might be?” asked Tranditis. Already, the new Greek Prime Minister Alexis Tsipras has made conciliatory moves toward Russia. And Russian President Vladimir Putin reportedly tried to convince him to veto the renewal of European Union sanctions imposed on Russia for its involvement in Ukraine. The new Greek defense minister also participated in a Moscow conference with his counterparts from Iran and North Korea. There undoubtedly was great concern about this evolving relationship, Sarah Lain of the Royal United Services Institute says. 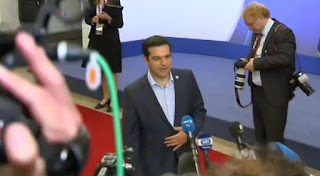 But analysts like Lain, who spoke to VOA via Skype, point out that while a difficult deal with the EU can have a positive long-term impact, Greece can’t rely on Russia for much help, as it struggles with its own economic problems. Transditis says it would take a lot of upheaval for Greeks to look to the East for their future, rather than the West. “Russia might be a profitable commercial partner, but it’s not the model that Greece should follow,” he says. And experts say that broader concern led key non-eurozone Western powers, like the United States and Britain, to push for a settlement and avoid the possibility that a financial dispute could lead to a geopolitical shift.